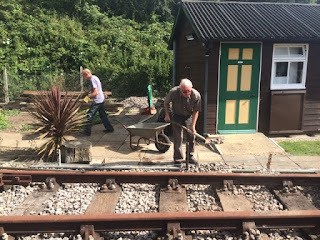 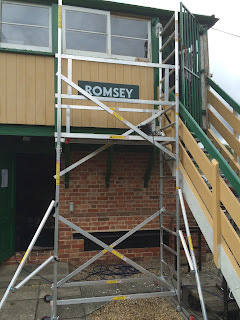 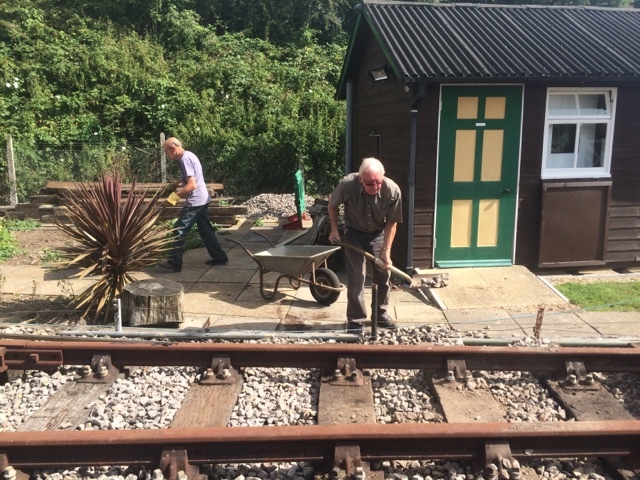 Work continues at the signal box between open days and on Wednesday we had the first use of our new scaffolding tower. 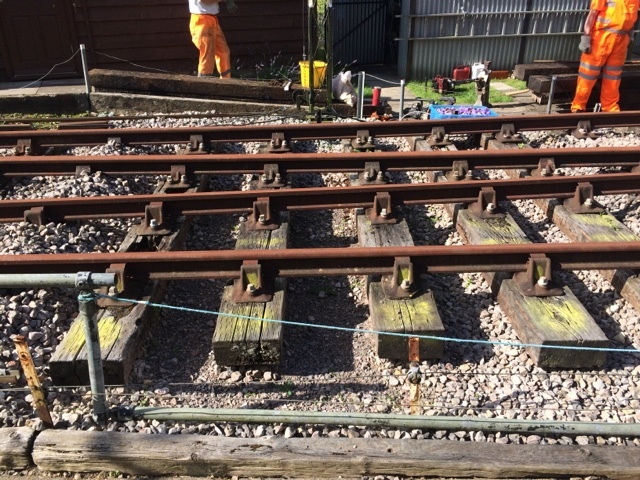 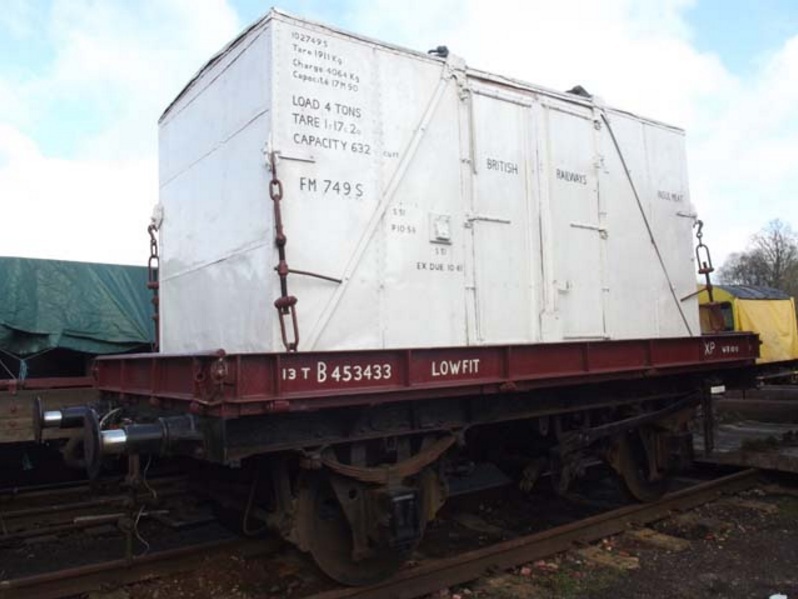 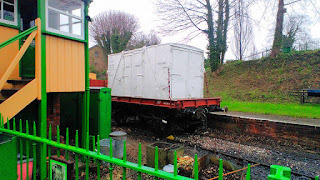 It has been assembled by the extension part of the signal box to allow our work force (Dave and Keith) to start stripping the paint from the box ready for it to be repainted. 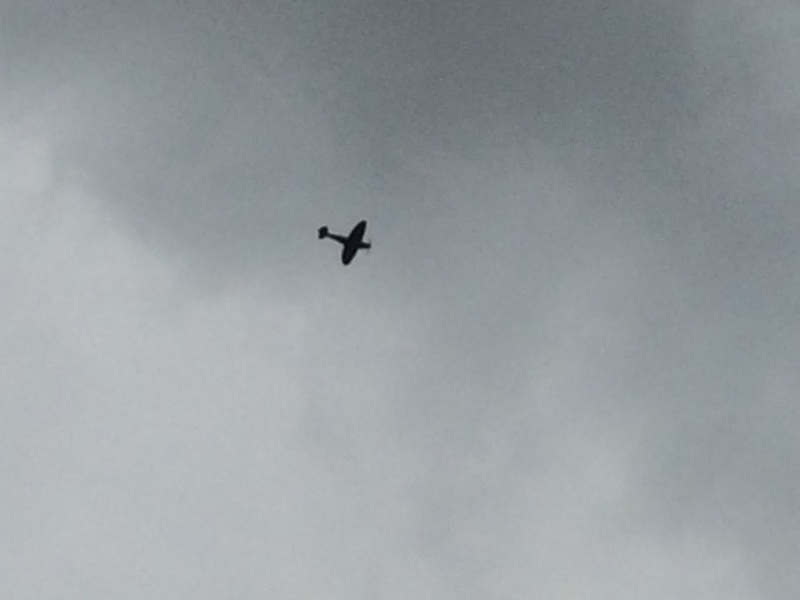 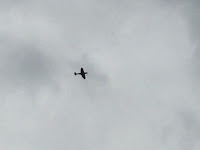 Unfortunately due to the British weather, they didn't get very far and soon had a stop because of the rain. Hopefully the scaffolding will make it easier for them to do the work and, more importantly, safer. 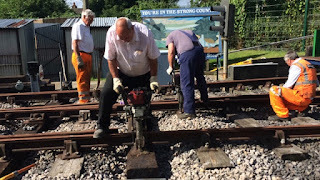 Don't forget we're open on Saturday and we also have our members social event going on but this will not effect our open day. 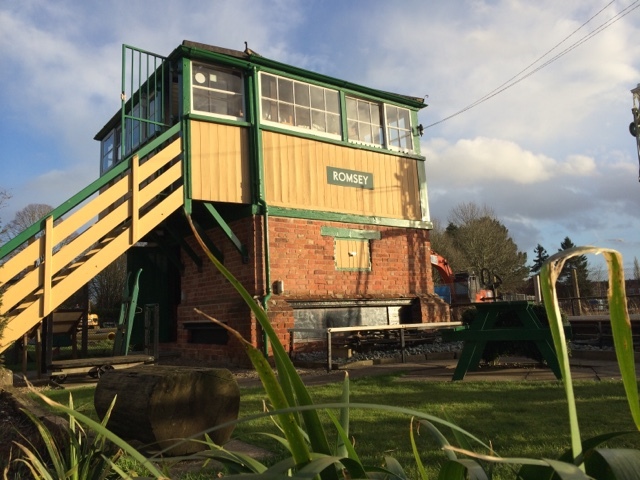 Don't forget to keep an eye out for the next edition of our newsletter coming early next week. 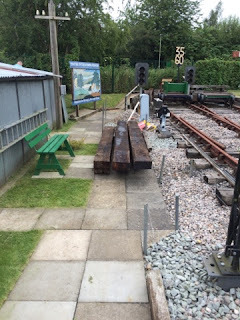 Its been a while since we last updated you with activities on site, so here we go with a mega post! The area behind the pavilion, where the willow tree once stood, is now being developed. The tree has been cut down and the stump has been ground away. 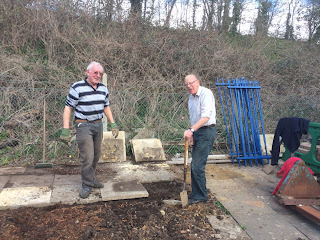 It was only today that Adrian and Allan started to lay some slabs. 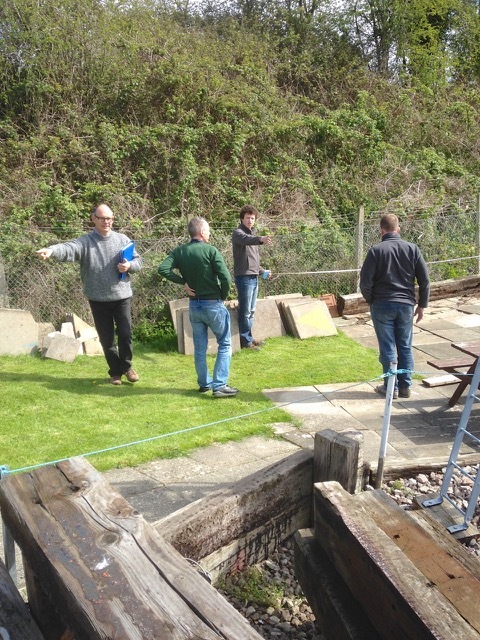 We are not 100% sure of the plans for this site, but the slabs they have laid will keep the weeds down for now. 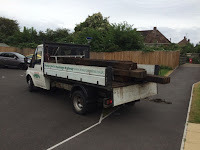 They also spent the day burning bits of scrap wood (and the remains of the willow tree) so we've had a good tidy up, but there's still more to do before we've got our store shed sorted and the site tidy. 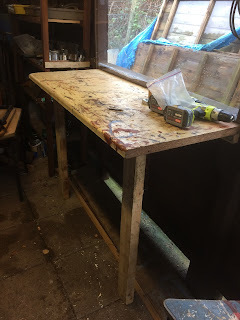 Dave has been working on the TV stand in the pavilion. 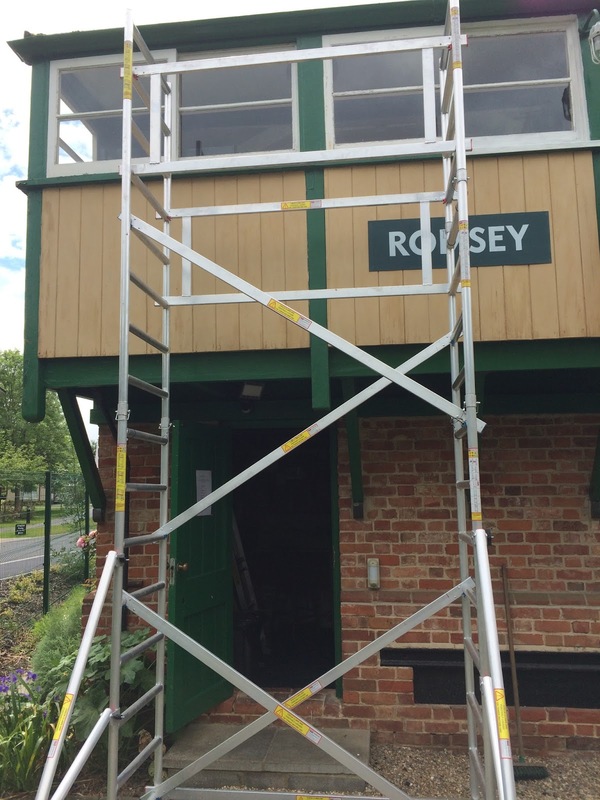 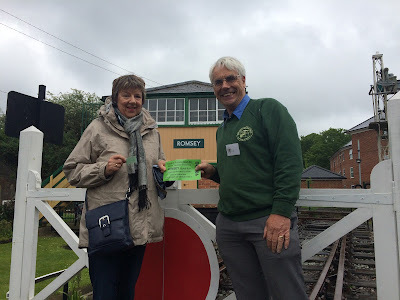 We now have a new wired camera feed from the signal box (so disabled people can watch the demonstration) which is a big improvement from the wireless system we were using. We also have a new TV and because things were getting messy in the space below the TV, Dave decided it was time to re-build the stand. 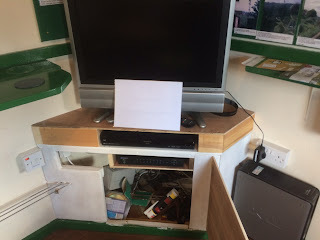 He has replaced the top and made a housing for the various TV inputs. 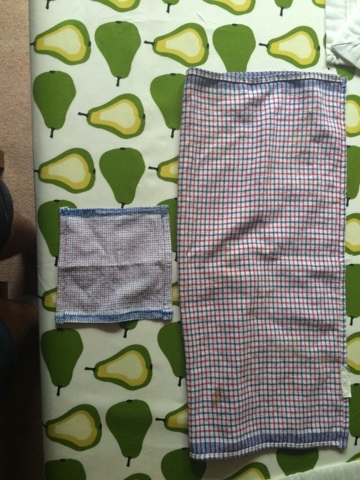 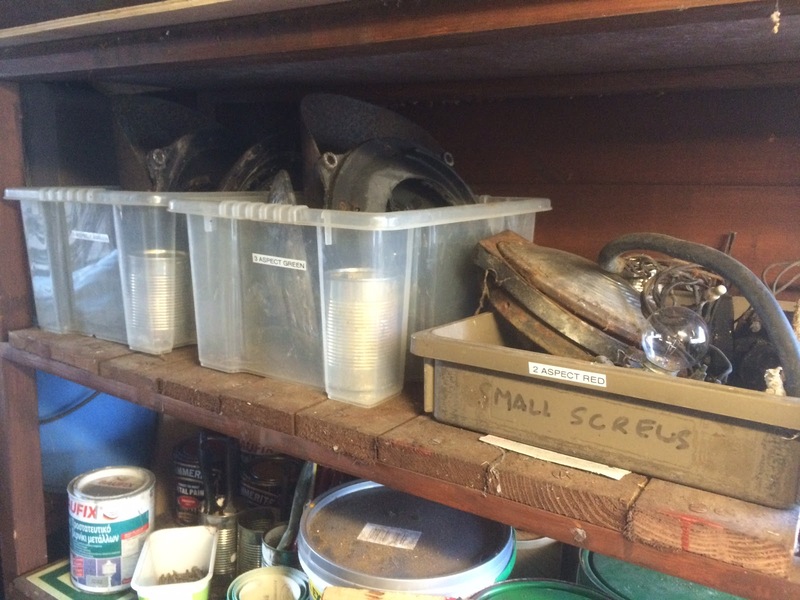 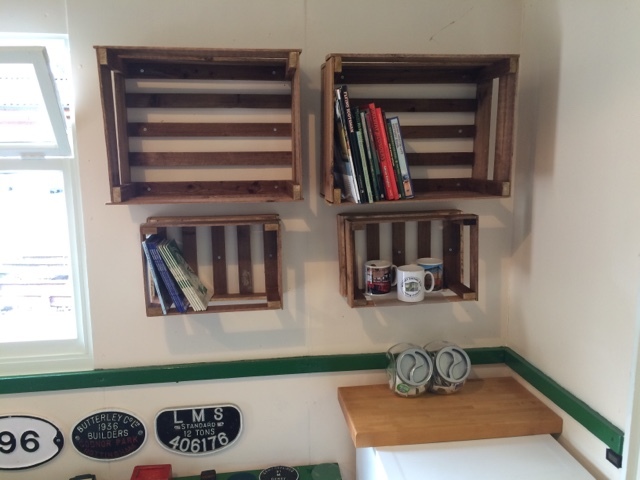 This means that everything is kept tidy and we still have space to store more 'stuff'. Keith has been busy in the Cowley bridge building gluing baton over the joins in ply wood walls and ceiling. 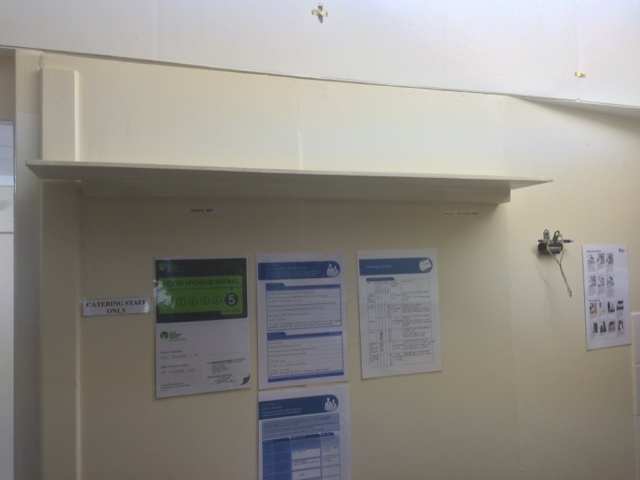 This is replacing the masking tape that was originally used to cover the gaps, but just kept falling off. 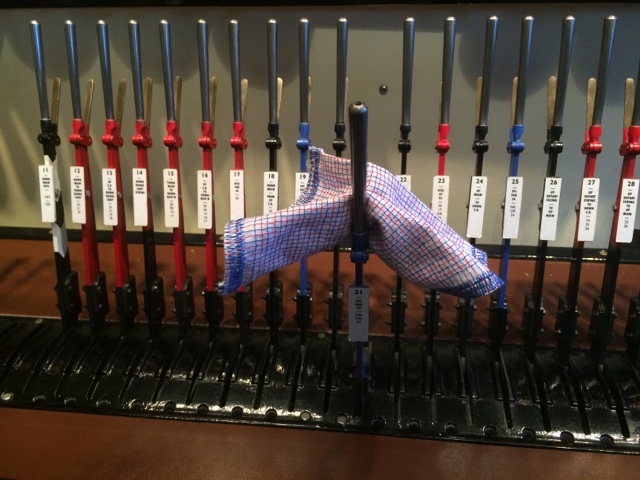 The new baton really finishes the room off and hopefully wont fall off. 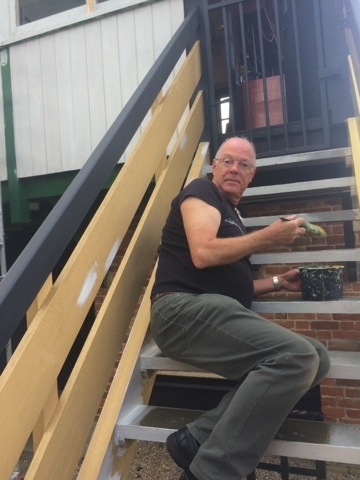 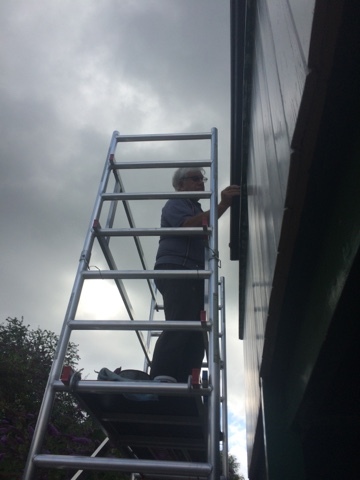 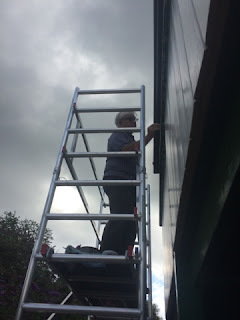 Once he had finished inside, he moved outside and has started to re-paint the outside of the pavilion. 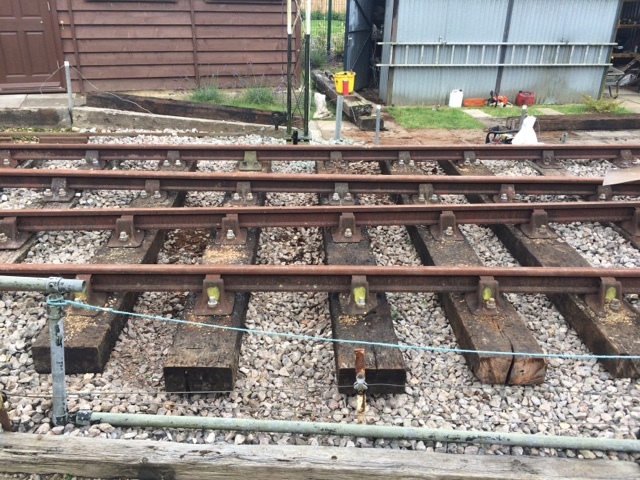 This was done recently, but a fairly low quality preservative was used, so its being 'topped up' with some more, higher quality, preservative. 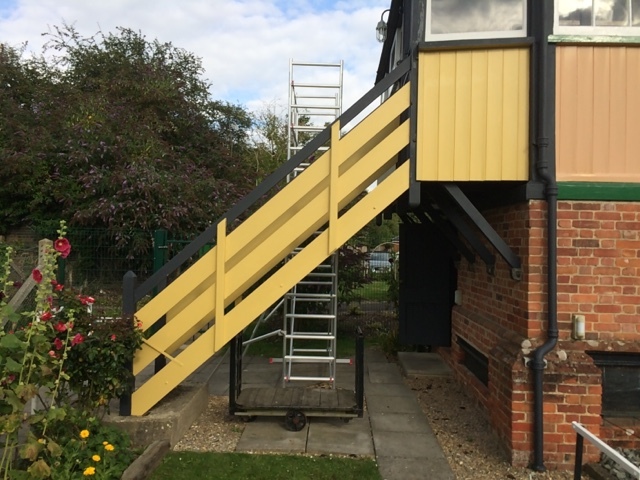 It does make the exterior look better. 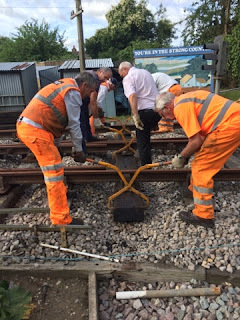 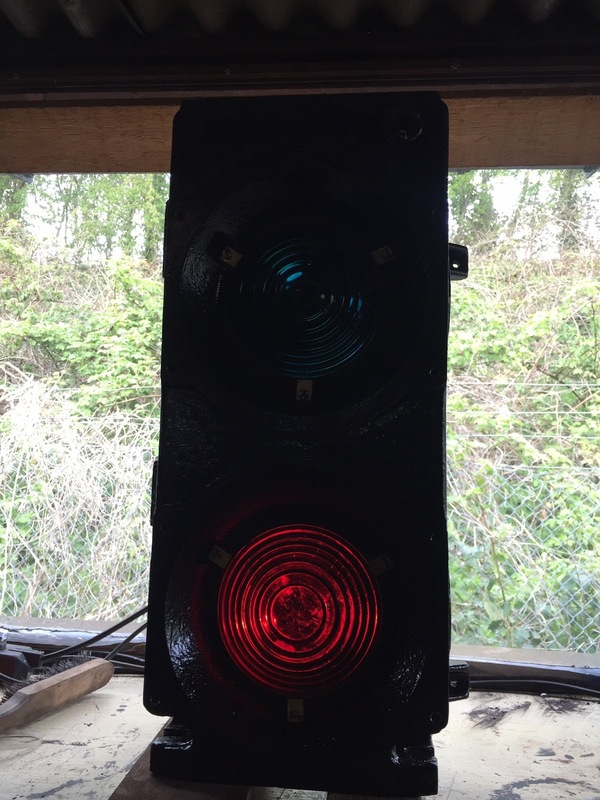 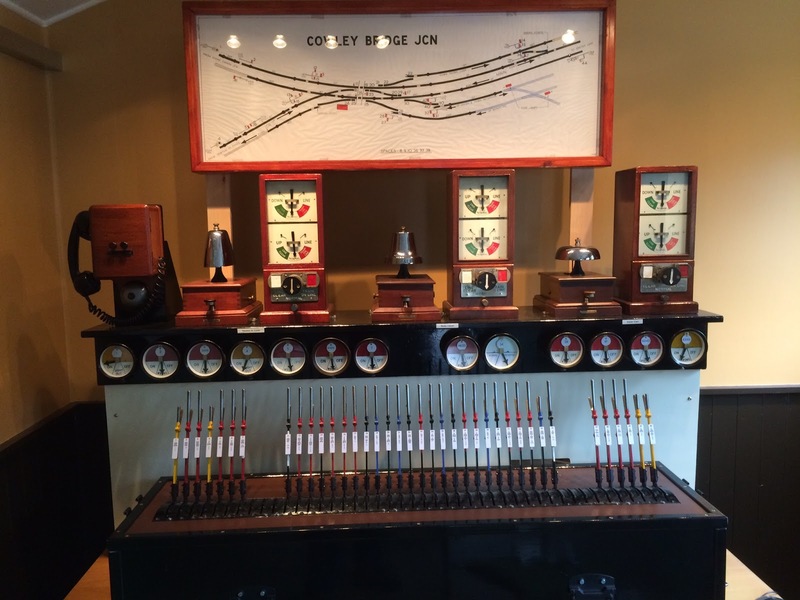 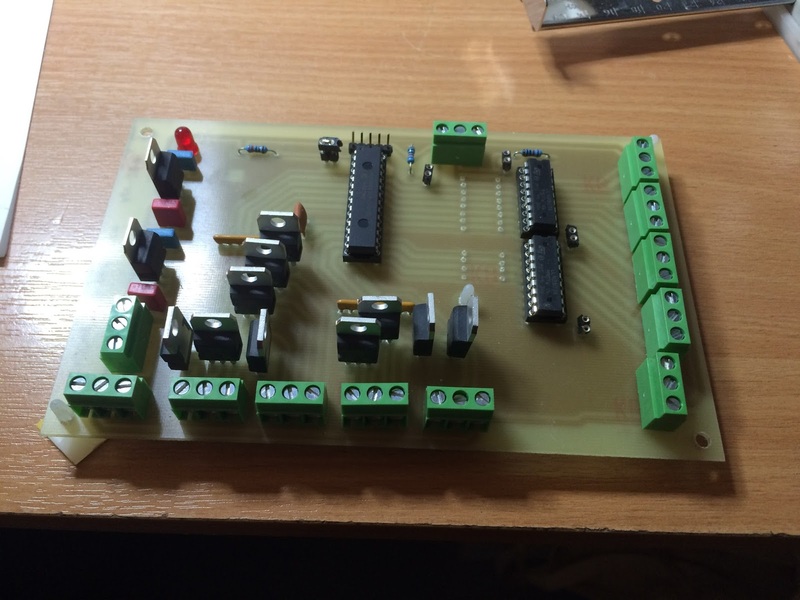 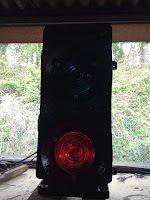 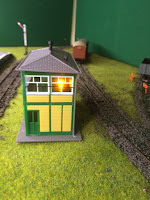 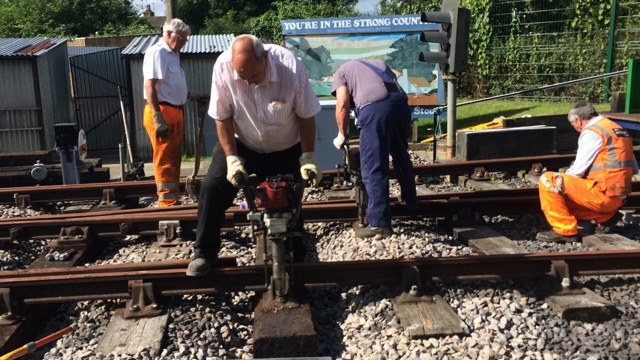 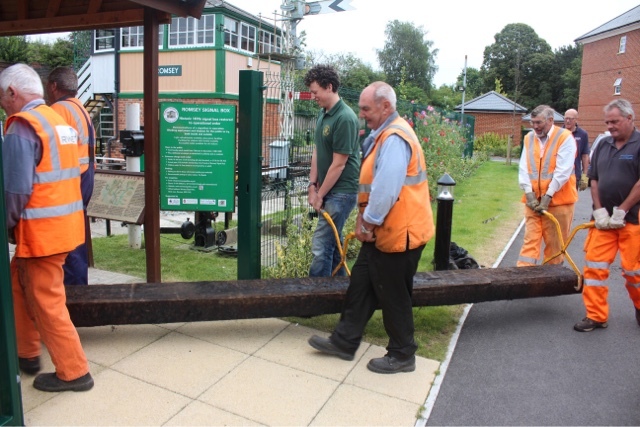 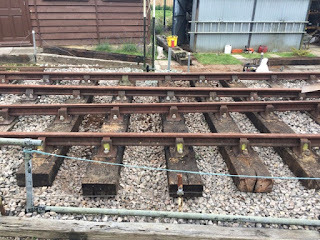 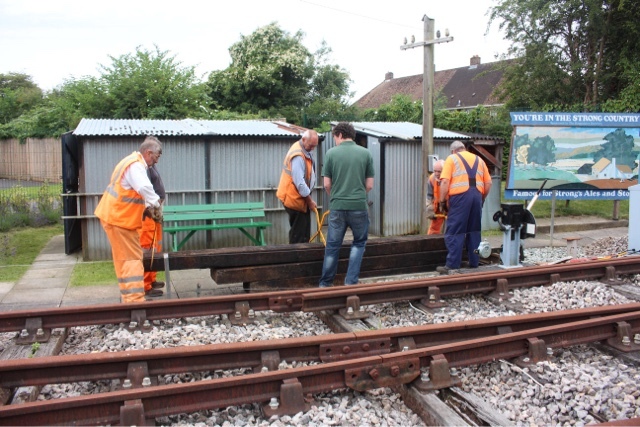 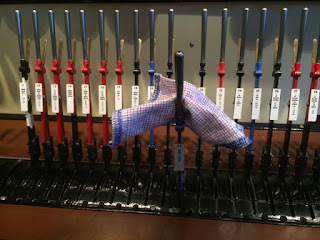 Jamie, Gavin and various other members have been working on various signalling artefacts. 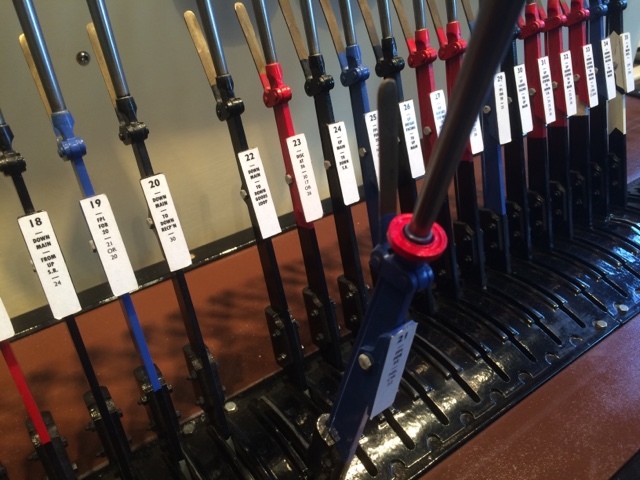 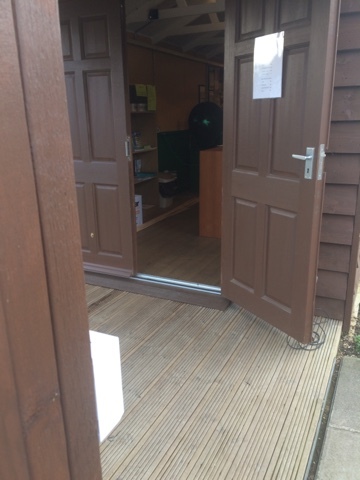 The main things in the 'workshop' (lean-to) are the colour light signal (CLS) heads. These will make up our display on multi-aspect signalling to show how 4, 3 and 2 aspect CLS work together. 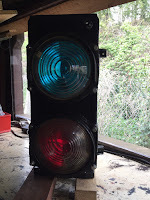 These will run up along the fence line by the railway and should help explain what all the different colours mean. 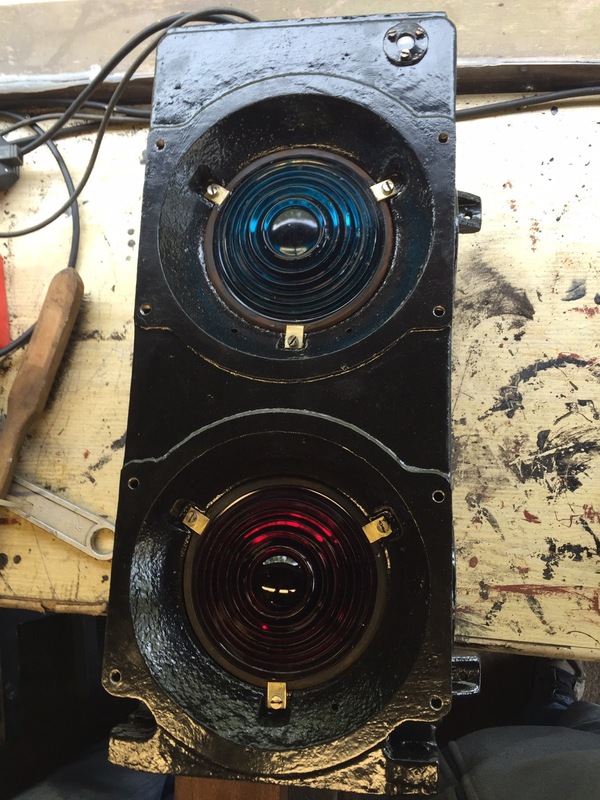 The two aspect signal needed completely stripping down and restoring inside and out. 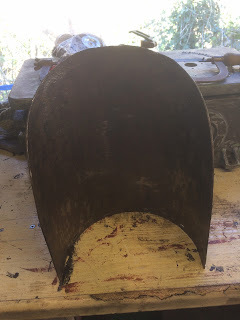 This signal is currently in pieces on the work bench and is pretty much ready for priming and painting. 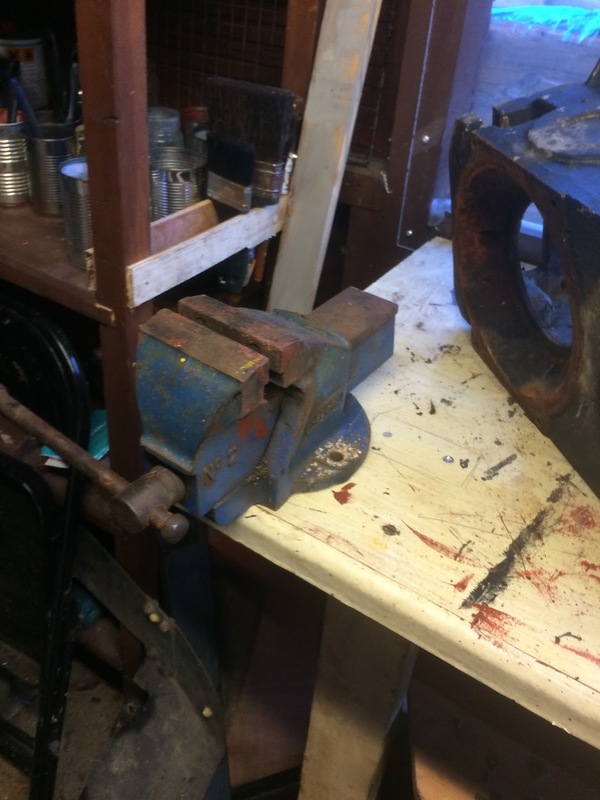 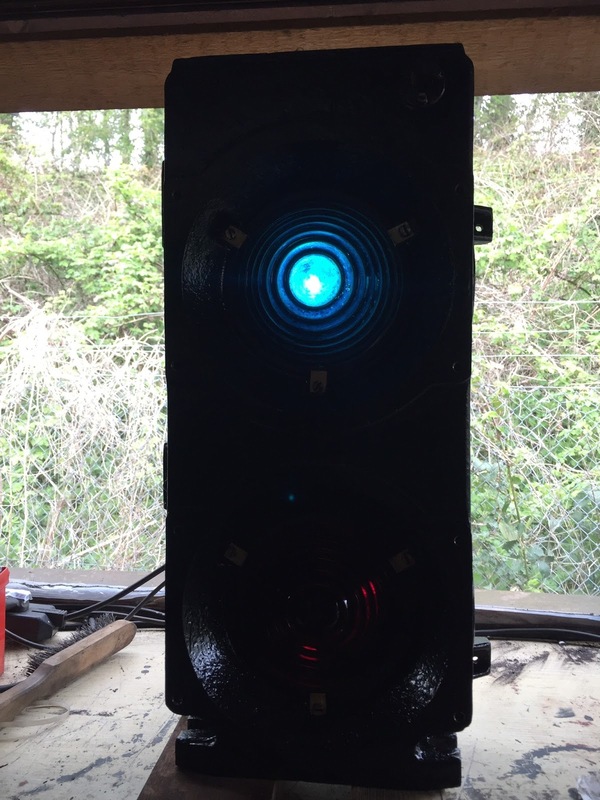 The three aspect signal only recently got brought into the workshop and is in a better state than the 2 aspect signal. The insides are in a much better state and do not need repainting. 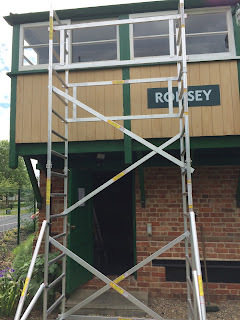 The outside was mostly OK, but because the cowls were in such a bad state and needed repainting, the whole exterior must therefore be repainted. 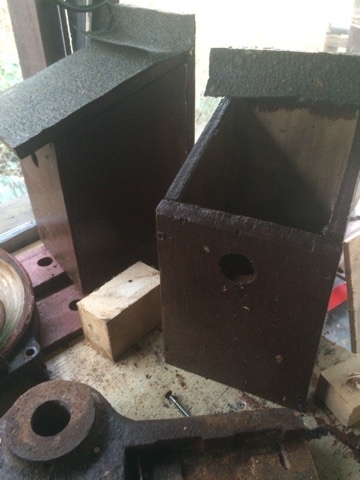 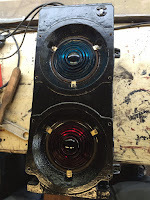 Today I disassembled this signal and started to strip the paint off of the cowls. I have completed one, half done another one and the third is yet to be started. 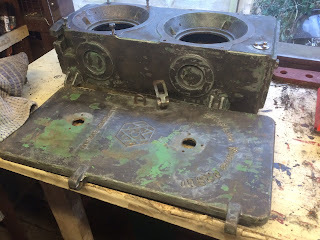 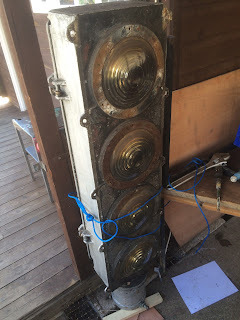 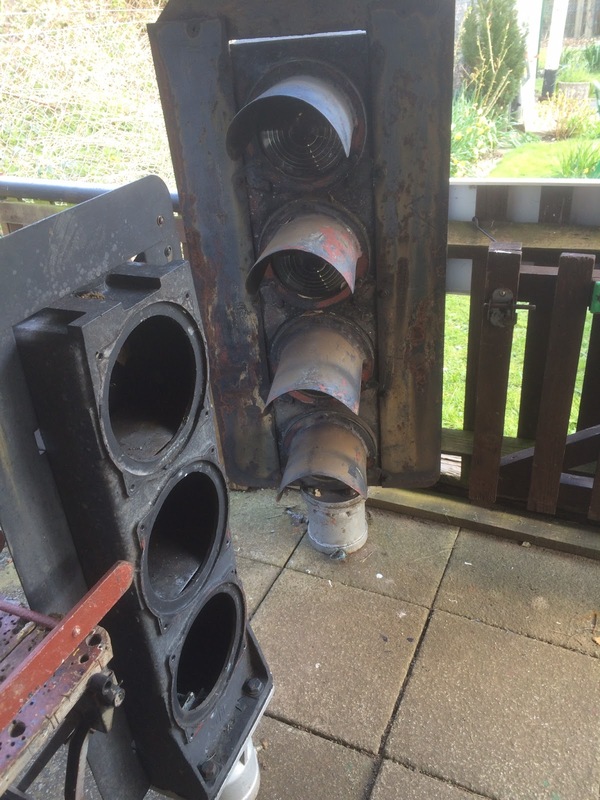 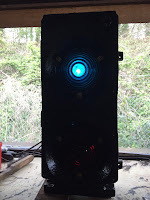 The four aspect signal was only brought into the workshop today and I've decided its in very much the same state as the three aspect, only needs outside restoration. I therefore started to remove the cowls and next time the lenses need removing before we can start to wire brush the metalwork. 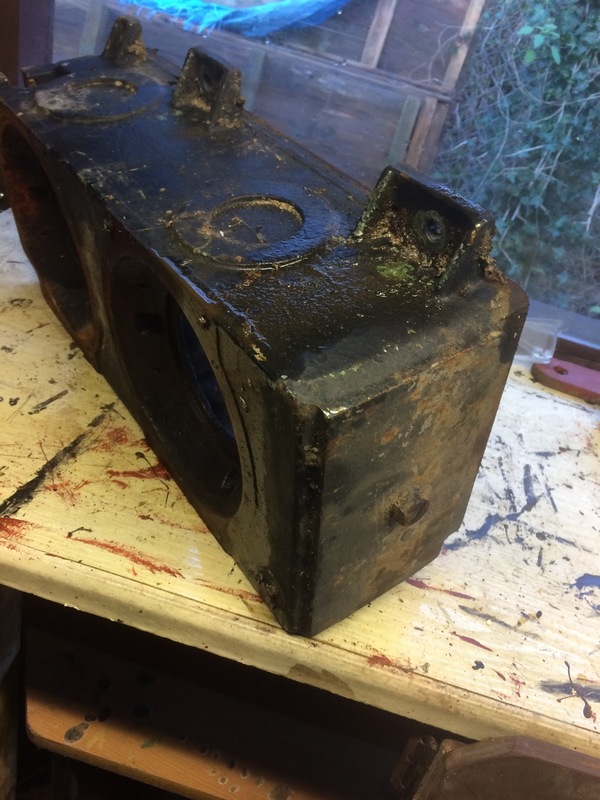 The lenses must be removed before we start this to prevent them being scratched or damaged. 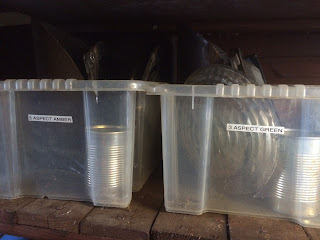 All of the parts that have been removed are being stored in their own boxes just in case certain pieces fit better in certain lenses. The boxes are labeled with the signal they are from and the lens that it relates to. 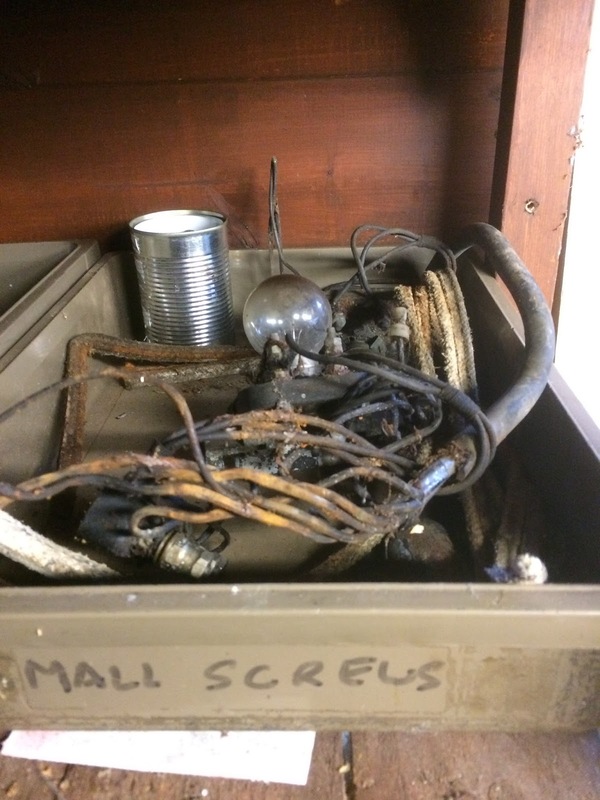 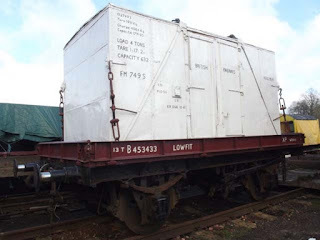 Any members wanting to help in this restoration project, we ask that you try to keep the items in the box they came from. 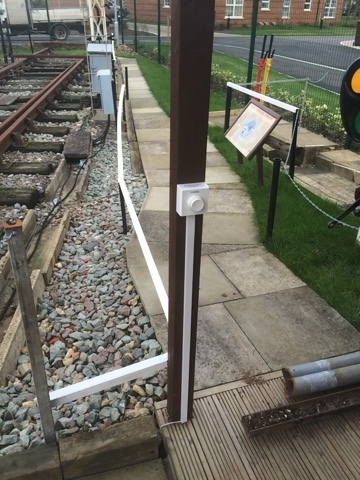 Please ask one of our regular site team volunteers before embarking on work on these signals. As you can see, we've all been very busy and today the sun even decided to make an appearance. If you fancy helping out, get in contact with out site manager to find out when you can come along to help out. 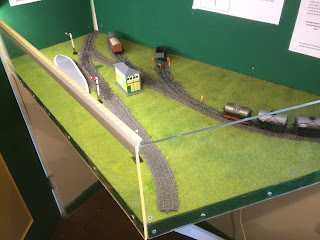 Don't forget we'll be open on Sunday, 12:00-16:00 so pop in to see the site and the work we're doing. 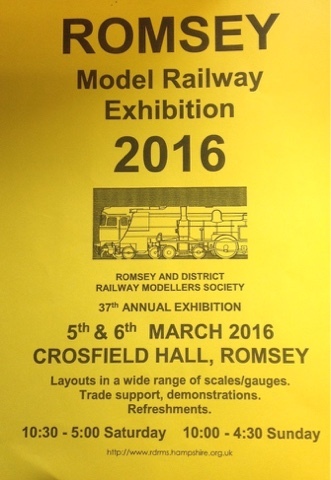 Don't forget that while we're open this weekend, the Romsry model show will also be taking place. Be sure to stop in and see what's happening!